to hear Silent Night because I arrived before it had played. I cried with its impact. it before I got it back! Thank you for the fabulous Christmas album. David and Jessica, it is wonderful! feel the presence of our Lord. What a terrific gift to the body of Christ. I just listened to it, twice! Love it! The narrative is great and the "jazzy" parts are wonderful. As usual, David's fabulous voice is a blessing! Thank you! heart now that we live in a city that so desperately needs to be ransomed. I am so delighted with your new Christmas Album. It is wonderful. I sent it on to my sister who will be blessed. Would like to order two more. Truly heavenly. Thanks for a distinct and fresh approach to traditional music. Oh my goodness do I love David's new CD. We want to get more for family. 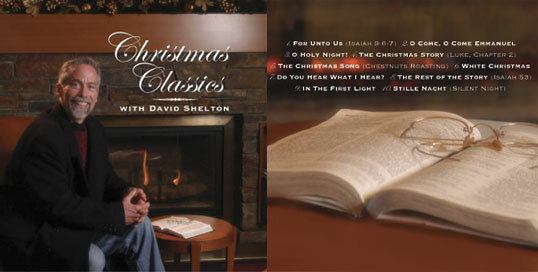 David needs to do more Christmas CD's. I love his voice!!! And I love the songs with your beautiful Jessica in it. Her voice is so pure and beautiful!! I get chills! We praise God for this project! So wonderful! !